The government of Edo State has said it’s taking decisive steps to solve the problem of shortage of teachers in some schools in the state, applauding the efforts Igbanke Unity Forum (IUF) on improving education in the community, reports ITRealms. The Edo State Governor, Mr. Godwin Obaseki, made this disclosure at Igbanke in Orhionmwon Local Government Area of the state, when Igbanke Unity Forum (IUF), a non-governmental organisation (NGO), donated 4,500 branded exercise books to three schools in the area, at the weekend. Governor Obaseki, represented by the Commissioner for Education, Hon. Christopher Adesotu, said though the shortage of school teachers was not peculiar to Igbanke, the state government has set the machinery in motion to address the matter. He said his administration appreciates the partnership with NGOs, corporate bodies, and old students’ associations, adding that such collaboration helps in checking the challenges in the educational sector. Adesotu said Obaseki’s administration has a strong commitment to revamp basic education in the state, and lauded the philanthropic gesture of IUF members in giving back to their community. Spokesman for the group, Edomaruse Collins said the forum has over 4,000 members spread across the world and its membership is open to indigenes of Igbanke only. “IUF embarked on this project as a deliberate move to support your government’s bold steps so far taken to revamp the state’s basic education. No government, no matter how benevolent, can single-handedly provide all the educational needs of its citizens”. He said members of the IUF are motivated to contribute their quota to the development of schools in Igbanke because they were uncomfortable with the state of some of the schools. 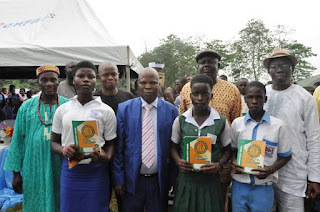 He said the books are for three schools in Igbanke, which include, Igbanke Grammar School; Igbanke Mixed Secondary School and Omolua Mixed Secondary School. He appealed to the state government to fix the decrepit school buildings as well as address the shortage of teachers in the three schools as the ratio of teachers to students was not encouraging. Pix: His Royal Highness (HRH), the Enogie of Oligie-Igbanke, S.E. Osunde (left); Collins Edomaruse, BoT Member, Igbanke Unity Forum, a Facebook group (2nd from left, 2nd row); Commissioner for Education, Edo State, Hon. Christopher Adesotu (in suit); Hon. Mike Nmoka, and Comrade Uwagbai Eric, with students from Igbanke community during the presentation of 4,500 branded exercise books to three schools in the community by the Igbanke Unity Forum (IUF), at the weekend.